Looking for a new appetizer to try out? Then give this recipe for deviled eggs with yogurt a whirl—we know you’re going to love them. The recipe makes for six servings, and it’s a perfect dish to make for a family get-together or as an appetizer before dinner. These eggs are also easy to make, so you’ll be able to whip them up in practically no time. And they’re surprisingly healthy too, as one serving (one egg) only contains roughly 100 calories. After trying out this recipe, please make sure to rate and review it—we’d love to hear what you thought of this dish. If you’re looking to make this curry deviled eggs recipe, then you’ll need to assemble the following ingredients: Six large eggs, one teaspoon of honey, some yellow mustard, curry powder, cider vinegar, cayenne pepper, Cabot Lowfat Plain Greek yogurt and a quarter cup of finely sliced green onions or shredded carrots (we recommend using both). Take a saucepan and immerse the eggs in water, then boil the water and cook the eggs for two minutes. After that, you’ll take the pan off the heat and let the eggs sit in the warm water for ten full minutes. Remove the eggs from the water and peel the shell off, then cut the eggs lengthwise and remove the yolks. Add the curry, vinegar, cayenne, yogurt and honey to the yolk mixtures and whisk everything thoroughly. Then you’ll put the mixtures back into the shells. Enjoy! If you like this recipe, you may also want to try our Avocado Deviled Eggs! They’re rich and creamy and work great as an app. Cabot is a cooperative of over 1,000 family-owned dairy farms, and we work hard to produce a vast array of top-notch dairy products. We’re positive that you and your family will absolutely love this recipe for deviled eggs with yogurt, but we’d like to hear your thoughts about this recipe. After trying it, please make sure to rate and review it! Also, pass this recipe along to your family and friends and Facebook, Twitter and Pinterest. COVER eggs with water, in medium saucepan. PLACE over medium-high heat until water begins to boil; cook eggs for 2 minutes. Turn off heat, cover pan and let eggs sit for 10 minutes in hot water. DRAIN and run under cool water until easy to handle. Peel eggs, cut lengthwise, and remove yolks to small bowl. ADD honey, mustard, curry powder, vinegar and cayenne to bowl; mash together with back of spoon until no lumps remain. Whisk in enough yogurt for desired consistency. Fill each egg white half with some of yolk mixture. Top with green onions, carrots or both, if using. 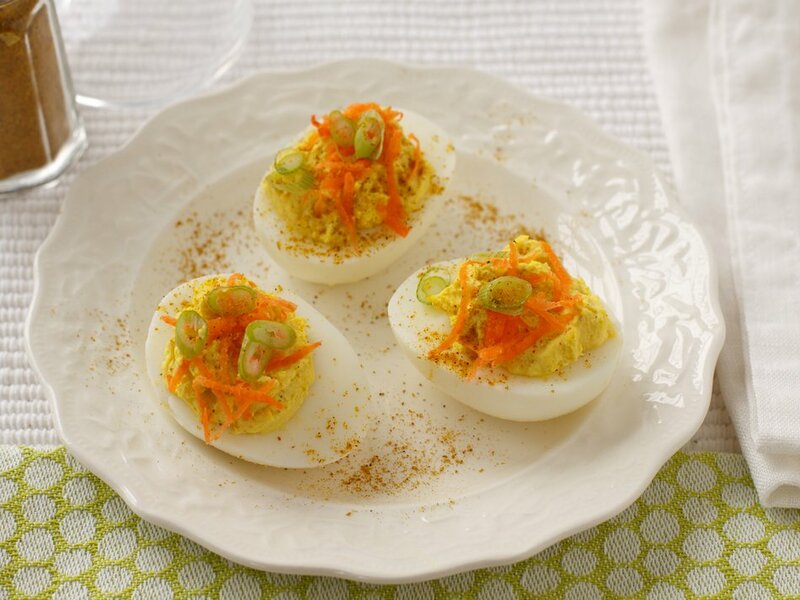 Loving this healthier version of Deviled Eggs! 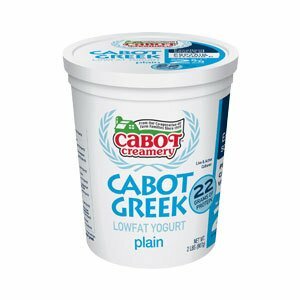 We already purchase Cabot's Greek-Style Yogurt for breakfast and for snacks and our kids love it so being able to use it for cooking with in other recipes is an added bonus! LOVE LOVE LOVE this recipe and it was super easy to make too!